One of the exciting aspects of the roster shakeup lately is the introduction of two new pitchers to the MLB bullpen that we’ve seen very little of (unless of course you live in Harrisburg, PA and stop by the Senators games all the time). So lets take first look at newly promoted 22-yr old LHP Ian Krol. A quick introduction: Krol was the PTBNL in the Michael Morse trade, coming over from the Oakland organization after a relatively tumultuous minor league tenure (he missed the entirety of the 2011 season after an elbow injury and then being suspended for an offensive tweet; ah a sign of the times). After returning to the fold in 2012 he was relatively awful as a California league starter (not really that surprising; look what happened to A.J. Cole when he went there), then was bumped up to finish the season as a AA reliever with poor numbers in a short sample size in the Texas league. Even for an organization like Oakland, apparently that was enough; they made him available in trade and he turned into the PTBNL. He arrived in Washington and has immediately been significantly more effective as a reliver here: his AA numbers have been eye opening; 26IP, 14 hits allowed, only 2 earned runs for an ERA of 0.69, and a K/BB ratio of 29/7. I thought these numbers would earn him a promotion mid-season; I didn’t think we’d be seeing him in the MLB bullpen in June. Lets look at his performance in the 6/5/13 debacle loss to the Mets. He pitched the 6th inning and faced the top of the order. He gave up a fluke single when Daniel Murphy flailed his bat at an outside fastball and dinked the ball into LF, but otherwise he struck out the side, punching out the 3-4 hitters for New York with relative ease. He threw 23 pitches, 19 of them fastballs. Per his Pitch F/X data, his fastball averaged 95.28 and peaked at 96.88 on the night, quite a heavy ball from the left-hand side. He has a relatively deceptive release point which makes that fastball look even faster. A lot of the swings he got were very, very late. With this kind of fastball and short-term effectiveness, he can easily serve as the “Loogy” that many pundits have been saying this bullpen needs. He has clean mechanics, did not lose velocity pitching from the stretch, and didn’t seem like he was throwing with max effort. Now, on the downside, the 4 pitches Krol threw that were not his fastball left something to be desired. He attempted three curveballs and all three of them seemed almost to slip out of his hand and flayed way to the left-hand side of the plate. In fact he nearly hit Lucas Duda with one attempt. He also attempted one changeup that he managed to bounce about 5 feet from home plate for a wild pitch (I’m sure that’s going to end up on the weekly “wildest pitches” video on one national baseball blog). So we now see some evidence of why he has been moved to the bullpen; no decent or trustworthy secondary pitches. On the bright side, a 95mph left-handed fastball with deception is going to be darn hard to hit even if the hitters know its coming. In this respect, he’ll make a good short-stint reliever even if he can’t trust his secondary stuff. On the downside, the scouting reports are going to get out and eventually hitters will know to sit on a FB. Even if a ball comes in at 100, MLB hitters can hit it. So Krol is going to have to show he can throw a curve or change with effectiveness and control to stick. That being said, it was pretty exciting to see a youngster like Krol punch out three pretty good hitters. The one bright note on a crummy night for the Nats. Subscribe to comments with RSS or TrackBack to 'First Look: Ian Krol'. He definitely threw a lot harder than I was expecting. Not a lot of lefties pumping it at those speeds. I like having him and Abad up now. 2 hard throwing lefties balances out the bullpen some. Garcia threw 2 innings last night and appears to be heading in the right direction. If he can come back an replace Davis in the pen things might really take shape. Nothing wrong with Davis but I like Garcia better in that spot. Have you seen any velocity reports on Matt Purke? I haven’t as of yet but his stat line looks quite tidy after 2 starts. 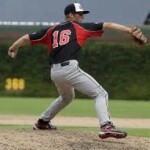 A 7/1 K/BB ratio looks very good for a pitcher coming off surgery. 14Ks in 8.2 innings looks very solid too. Granted his talent level should place him in AA or AAA at this point but it is encouraging nonetheless. Solis looks good too. Hopefully Solis can K a couple more batters in his start tonight but all and all it is nice to see these 2 throwing. I know I have mentioned this before but all of the sudden the Nationals pitching prospects really seem to be making strides. Taylor Jordan is still dominating and has been even betterafter his promotion to AA, Robbie Ray has 81Ks in 62 innings for an awesome 11.76 K/9 ratio. Blake Schwartz has come on strong this year. A.J. Cole’s peripherals are still strong but his ERA is high but there is definitely still some promise in his young arm. The longer they succeed the better it looks for trading Meyer. Things were bleak at the beginning of the year prospect wise but now it looks like the farm system has more hope. I was at the stadium last night, and the expectation that Krol and Davis would get into the game was the only reason my wife and I hung around through the 7th inning. The two were actually quite a contrast as Krol was going right after the hitters with his fast ball, while Davis seemed to be nibbling. Krol got a standing O from the fans for striking out the side. It was the only real highlight of a very dismal night at the park. @PDowdy – you’re right about the pitching prospects providing hope. We need some right now as this season is rapidly going down the tubes. Garcia: great news. Is he going to try to be a starter though? Its unclear by his usage thus far; clearly he’s just building up innings like he’s starting spring training over again. Purke: no idea about velocity (no radar gun readings in the Gamer in the Hagerstown paper, just about the only place i’d hope for them) but you’re right his stat lines look great thus far. For a guy in low-A i’m really looking at Ks and BB rates above anything else. Perhaps go/ao ratios. The defense and fields are just so suspect that its hard to get a good read by era and whip. Nats pitching prospects coming out of nowhere: completely agree. Purke back throwing, as is Solis. Jordan out of nowhere. Schwartz is great. Ray has it back again after a down year. I’ve got to publish my May minor league review… too much going on! Ladson reported Garcia was going to be rehabbing as a reliever and I heard Davey mention that in a post game. I think they may just be starting him to get in guaranteed work every other day. Although with the rash of injuries who knows from day to day with this organization lately. His next outing may shed more light on things. If he only goes 2 again my guess is as a reliever. If he goes more than 2 maybe they are stretching him out. I assume it may not be too much longer before Giolito is throwing some rehab innings too. That could turn into a pretty impressive stable of arms soon. Jordan is this years Nate Karns. Sidelined by surgery and now healthy looks VERY good. Garcia: Well, if you asked me what this system now needs, its starter depth. Badly. Stras and Detwiler out, being replaced by a MLFA and a guy with like 10 games above High-A. And Haren is leading the league in HRs allowed. And Gio’s forgotten how to be consistent. On the one hand yes I know Garcia is fragile and probably can’t handle starting. Anderson was looking decent in Low-A before a couple of unsteady starts. Ray and Schwartz looking good in High-A. Solis hasn’t been half bad either. This kid Caleb Clay has put together three really good outings in a row in AA. And I’m guessing that before long Rosenbaum will get his shot in the majors. Ugh…Rosenbaum. His ERA might be okay, but his perhipherals stink this year–only 38 Ks to go with 28 BBs in 62 innings. He looks more like fresh meat to throw to the lions than any sort of solution at this point. If he gets called up, the Nats will really be getting desperate. I agree with bdrube. I have little faith in Rosenbaum at the major league level. I’ve seen him pitch before and wasn’t overly impressed. It says a lot to me that the pitching starved Rockies didn’t keep him. It wouldn’t completely shock me if someone like Jordan leap frogs him. The team has already shown that they will take a guy with only a handful of AA starts. Jordan’s numbers are far better at AA than Karns were when he was called up too. I tend to agree with you about Garcia at this point. It could very well be the reason he went from coming in in relief in his first appearance to “starting” the last 2 games he has been in. Since his first appearance Stras got hurt and Detwiler hasn’t returned. The team also has a little relief depth vs no starter depth. If it is a scenario where they need a starter and he can provide a handful of starts I think they may make that gamble. Clay is an interesting guy to keep watching. Wouldn’t shock me if he gets bumped to AAA soon. Demny went now for the fill in start but I don’t see him staying at the level. Rosenbaum complaints. Look no further than one Thomas “Tommy” Milone. Though in Milone’s defense his last year in AAA he was greater than a K/inning. Let me put things a different way: right now would you rather continue giving Dan Haren starts or give Rosenbaum a shot? He couldn’t possibly be worse than what Haren is doing could he? (ERA 5.45, fip of 4.95, war of 0.1 indicating just about replacement level, leading the league in HR’s allowed despite being a sinkerballer). Garcia: now has 3 appearances on 5/31, 6/2 and 6/5. I don’t think he’s being bred to be a starter. I think he’s getting repeated work on a known schedule (i.e., starting off the game) to get him ready for bullpen work. Clay: interesting story. MLFA from Boston, we re-install him as a starter and suddenly he’s decent? Not a big K guy though. Clay’s K rate is climbing a bit. His last 2 starts he has struck out 18 in 15.2 innings. Small sample size of course. As a reliever the last 2 years his K rate was in the 8s so there is some sort of strike out ability in there. I think a bump to AAA would be an interesting experiment. The team has nothing to lose with him. I originally wanted to use the Tommy Milone comparison with Rosenbaum too but as you stated Milone struck out a lot of guys at AA and AAA where Rosenbaum has not. Interestingly enough, Rosenbaum compares decently to Lannan. Lannan had a 6.44 K/9 rate above his last 2 years in the minors. Rosenbaum is sitting on a 6.29 k/9 since 2011. Rosenbaum has a 2.76 BB/9 rate over that span vs Lannan’s 3.29. One other stat I can compare off of MILB.com is the ground out to fly out ratio. Lannan posted a 1.40 GO/AO in ’06 and a 1.66 GO/AO in ’07 before his call up. Rosenbaum has been far more efficient getting ground outs it appears. His rates are 1.70 in ’11, 2.29 in ’12 and 2.09 in ’13 thus far. After digging around through some numbers maybe I am selling Rosenbaum a bit short. I am not sure a switch from Haren to him will be a difference maker and I am sure the club with stick with Haren until the All-Star break but after that bit of research I feel better about Rosenbaum as a backup plan. Bit tardy on the response, but the most disconcerting thing about Rosenbaum is how his WHIP has risen sharply each of the past two years. Milone’s numbers were FAR better his last two minor league seasons–he was progressing as he rose through the system, not regressing. As for Haren, I was at the stadium last night and no, I don’t ever want to see him pitch in a Nats uniform again. But the Nats have 13 million reasons not to shut him down unless he manages to get hurt as well. Basically, this team is pretty much screwed this year no matter how you look at it. Rosenbaum: someone else pointed out the obvious; Colorado has an awful pitching staff and Rosenbaum couldn’t crack it. So what is he going to end up being? My guess: Trade bait. But, he has to get a call-up to get some MLB innings before someone would pay for him i’m guessing. But can’t you see someone like him doing well in a big pitcher’s park (San Diego, San Francisco, Oakland)? My guess: AAAA. I know the comparisons to Milone are frequently made, but like bdrube, I think that Milone put up much better numbers, particularly when taken in context, and the question was could he continue them at MLB level.